Pack Mat creates a more stable and comfortable stall base and reduces sand usage. With just sand bedding, the neck rail and brisket board is in the right spot for only part of the bedding cycle. Pack Mat reduces this variation as well as preventing the cows from digging holes. Cows find it easier to get up. All the BENEFITS of sand without the headaches!!! Reduces sand usage 50 to 80% - Sand goes 2 to 5 times further! Pack Mat combines the comfort and sure footing of Pasture Mat, with the hock friendliness of sand. 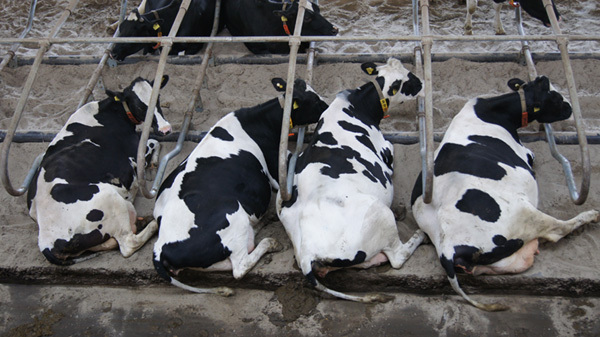 Cows cannot dig out the front of the stalls with Pack Mat, so there is no negative slope in stalls because the stall dimensions are stable, cows get up and down without struggling, reducing the stress level and reducing the amount of sand kicked out of the stall. Pack Mat is a multi-celled mattress filled with rubber crumb and protected by a durable-wear skin. Its yielding surface does not allow sand to compact, resulting in a softer bed. We know that stall design (dimensions) are paramount to cow comfort. When provided with ample lunge room and proper neck rail placement as well as nothing in front of the cow (other than the Poly Pillow), we see excellent stall usage. Cows enter the stall quickly (placing all four feet in the stall) and lie down with ease. With good stall design, cows get up easier and go to the feed bunk more often. sand, straw, compost, shavings and other 'pack materials'. In an existing facility, the stalls are "dug out" so that the mattress can be installed 2 to 3 inches below the surface. Once the mattress is in, it will be 1 ½ to 2 inches below the back curb level. Our durable top cover is installed over the mattress. In a new facility, the base is filled with properly compacted gravel then sand allowing for 2 to 3 inches below the back curb for mattress placement. Installations may vary depending on the stall base. Mattress must be placed on a surface that will not settle. It is recommended that the stall surface under the mattress be porous or have ample drainage. Installation may vary so it's best to contact a sales representative for full details. Poly Pillow is a soft, plastic arch that replaces concrete or wooden brisket barriers. Its gentle curves allow cows to step ahead on rising and permit natural leg extensions while lying down. It keeps the cow from moving too far ahead in the stalls and allows natural lying positions. Ask your Dealer of more details on installing the Poly Pillow(tm) in a Pack Mat stall. Sand savings of 50 to 80%! Cows get up and down easier! Stalls are easier to clean! "With these Pack Mats its sure bet they get up better. Some cows that get in loose sand push in too far. The Pack Mat is as soft as deep sand and its permanent." "There's really no difference (re: somatic cell counts between deep sand packs and Pack Mat) so long as you keep everything clean."